$372 for a $465 Value! the FPPE Toolbox, and the OPPE Toolbox together! 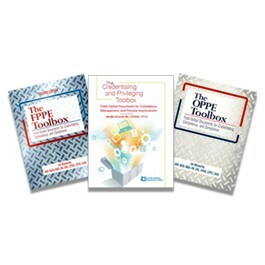 Inspired by our popular OPPE and FPPE toolboxes, The Credentialing and Privileging Toolbox offers a bevy of sample forms, policies, bylaws, case studies, letters, auditing tools, checklists, and related resources that healthcare organizations of various scopes, sizes, and service focuses are using to execute effective practitioner vetting processes. The second edition of The FPPE Toolbox: Field-Tested Documents for Credentialing, Competency, and Compliance provides an up-to-date, comprehensive resource with the forms and tools MSOs need to conduct and manage FPPE. This book provides compliant and customizable forms, policies, letters, scorecards, and reports that can be utilized in facilities of all types and sizes. Author Juli Maxworthy, DNP, MSN, MBA, RN, CNL, CPHQ, CPPS, CHSE, shares her expert knowledge so MSPs can create a cohesive competency documentation process at their organization. Get the tools you need to carry out OPPE. The OPPE Toolbox: Field-Tested Documents for Credentialing, Competency, and Compliance contains forms and policies that hospitals of various scope and size are currently using to conduct OPPE that complies with accreditors’ standards. Author Juli Maxworthy, DNP, MSN, MBA, RN, CNL, CPHQ, CPPS, provides medical staff leaders, medical staff professionals, and the quality team with best practices and highlights how to tailor the tools to your organization’s needs.